I have always liked French Toast, but Jake LOVES it! Seriously, sometimes he will come home and that’s all he wants for dinner. What do I care, its easy, fast, and I can make an extra piece for myself for dessert! What’s better than normal French Toast? 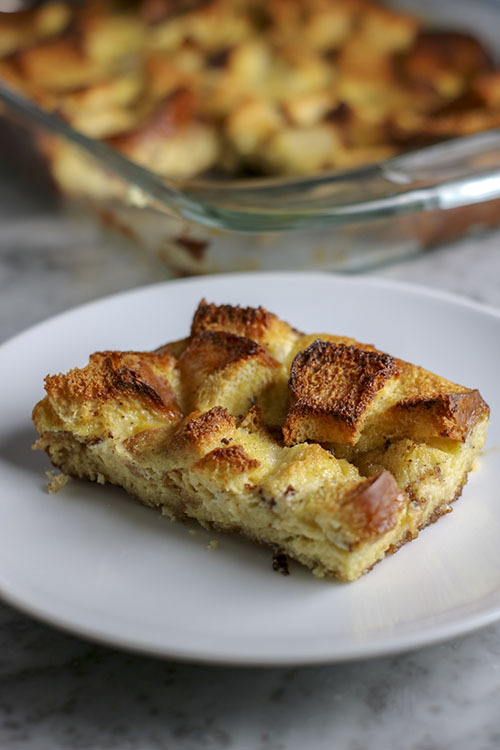 Well not much – but I’ll tell you there is one thing for sure… Overnight French Toast Casserole. Every year for Christmas morning, Jake’s dad makes an incredible Sausage, Egg and Cheese Casserole that is INCREDIBLE! 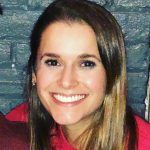 Not dietetic – in the SLIGHTEST! But nonetheless, delicious. However, this year, the family has decided to put a little twist on the normal Christmas traditions. Each couple was able to select a meal that they wanted to be responsible for making – inclusive of gathering ingredients, food prep, and final production. What did Jake and I choose (and by Jake and I, you know I mean – what did I choose)? CHRISTMAS MORNING BREAKFAST! Christmas morning breakfast is super important because you obviously need sustenance to get you through all that present opening. But, its also fabulous because there are an endless number of delicious casserole dishes which can be prepared ahead of time and soak overnight. 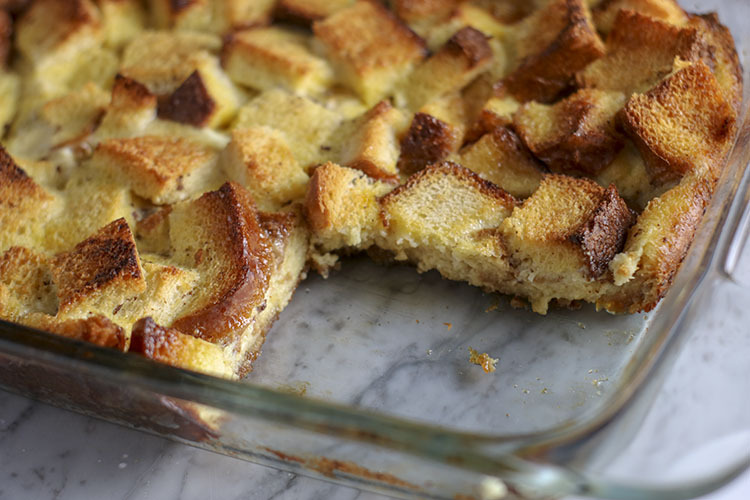 This Christmas, I have decided our breakfast will consist of two overnight casseroles – Wally’s traditional Sausage, Egg and Cheese Casserole and of course, Jake’s favorite – Overnight French Toast Casserole. Did I mention its easy AND delicious? 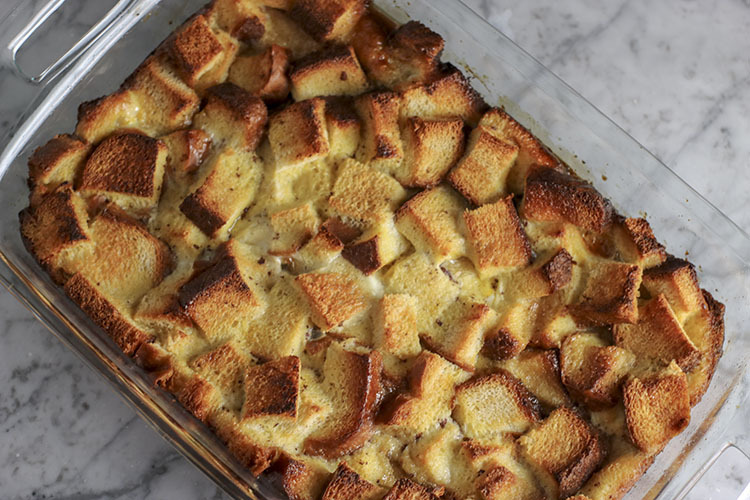 Warm, buttery, cinnamon sugar coats the bottom of each succulent piece of french toast. Dense bread soaks up all the eggy goodness and remains moist even after 40 minutes in the oven. 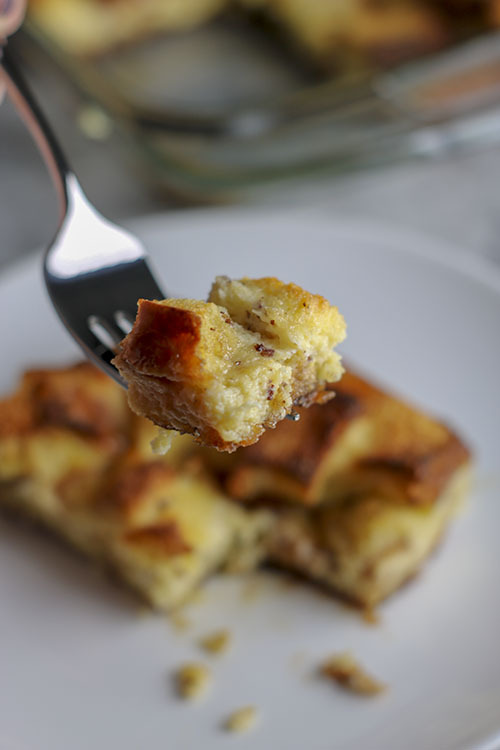 This recipe is just perfect for Christmas morning because you can make it late on Christmas Eve and it is ready to go whenever you are in the morning! Feel free to make this recipe your own by adding walnuts, pecans, apples, bananas – whatever floats your boat! 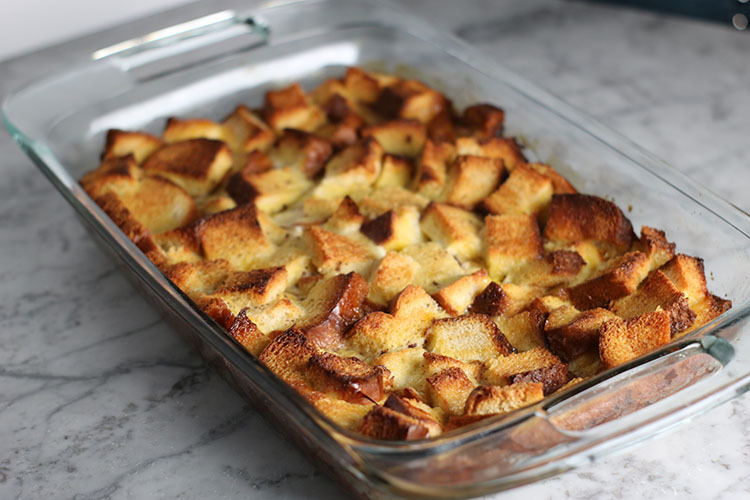 Personally, I love this casserole plain as is! But a few fresh banana slices on top is AMAZINGLY delicious! 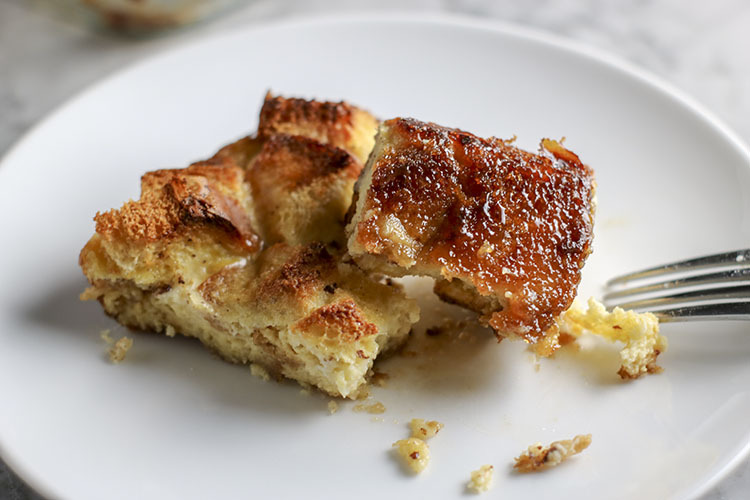 Warm, buttery, cinnamon sugar coats the bottom of each succulent piece of french toast. Dense, delicious bread soaks up all the eggy goodness and remains moist even after 40 minutes in the oven. 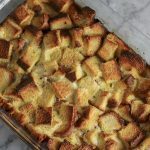 I guarantee this Overnight French Toast Casserole will become one of your family's favorites as well! Melt butter in a 9 x 13 inch pyrex pan. Sprinkle brown sugar over melted butter until most of butter has been absorbed. Slice bread into cubes or French bread into 1 inch slices. Place bread down into pan, slightly overlapping slices, covering butter/brown sugar mixture fully with bread. In a medium-bowl, whisk eggs, milk and cinnamon. Pour egg/milk mixture over bread. Cover with plastic wrap then soak overnight in refrigerator (minimum 4 hours). Preheat oven to 375F - remove casserole from refrigerator. Remove any plastic wrap from casserole pan. Bake at 375F for 35-40 minutes or until bread begins to brown and egg mixture has been full absorbed. Storage: Best enjoyed right away! If you must, cover with plastic wrap and refrigerate for up 1-2 days.